FACT: It is a low-growing and mat-forming perennial plant. The flowers have a purple colour and are edible. 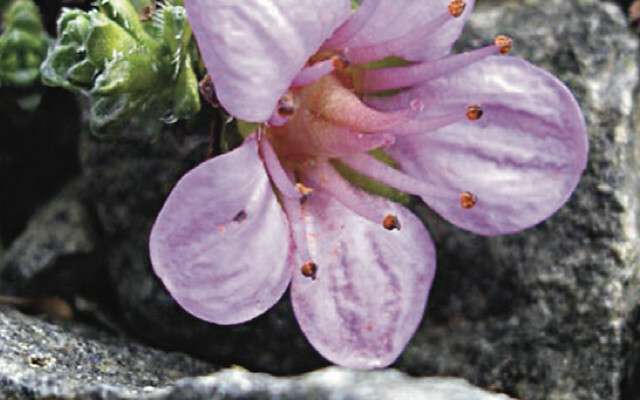 Saxifraga oppositifolia, the purple saxifrage or purple mountain saxifrage, is a species of edible plant that is very common all over the high Arctic and also some high mountainous areas further south, including northern Britain, the Alps and the Rocky Mountains. It is even known to grow on Kaffeklubben Island in north Greenland, at 83°40’N, the most northerly plant locality in the world. It grows in all kinds of cold temperate to arctic habitats, from sea level up to 1000 m, in many places colouring the landscape. It is a popular plant in alpine gardens, though difficult to grow in warm climates. It is a low-growing, densely or loosely matted plant growing to 3–5 cm high, with somewhat woody branches of creeping or trailing habit close to the surface. The leavesare small, rounded, scale-like, opposite in 4 rows, with ciliated margins. The flowers are solitary on short stalks, petals purple or lilac, much longer than the calyx lobes. It is one of the very first spring flowers, continuing to flower during the whole summer in localities where the snow melts later. The flowers grow to about 0.5 inches in diameter.